Investment guidance to align with your goals. If you were finding a broker who would suit your profile, you have arrived at the right choice. We are your gateway to Pakistan Stock Exchange. Invest in world’s top performing market through our real-time desktop and mobile trading application. Our qualified traders give you key insights and research about market trends so that you can invest profitably in the market. AZEE Securities is Pakistan's leading diversified Retail Financial Services Company, founded in 2003. It is Corporate Member of both the Pakistan Stock Exchange – PSX and the Pakistan Mercantile Exchange. AZEE Securities is a Financial Services company. Its major business comes from stock brokerage service for investors and traders. The stock brokerage offered services such as share trading, derivatives trading, IPO, Commodities, Indices, Portfolio Management, Online trading. PSX - Live market updates for KSE 100 Index, KSE 30 index & Shariah Compliant Stocks, PSX - analysis, data analytics, stock price history, announcements, and encompasses the advance and electronic trading system. Stock InvestingWe provide you real-time stock investing capability through desktop and mobile. You can invest in stocks on the go with our trading platform, and remain updated about your portfolio 24/7. Research SolutionsWe provide world-class research and trader services to investors. Our investment advisory service helps you select the right stocks as per your risk and return needs. Financial PortalWe provide investors Pakistan’s most powerful stock market portal to analyze stocks and make prudent financial decisions. We offer fastest stock trading solutions to investors so that they can seize the opportunity to profit, no matter how volatile the market is. With AZEE Securities, you can trade online through your mobile, desktop, and by phone. Now, you can stay connected with the markets no matter where you are. 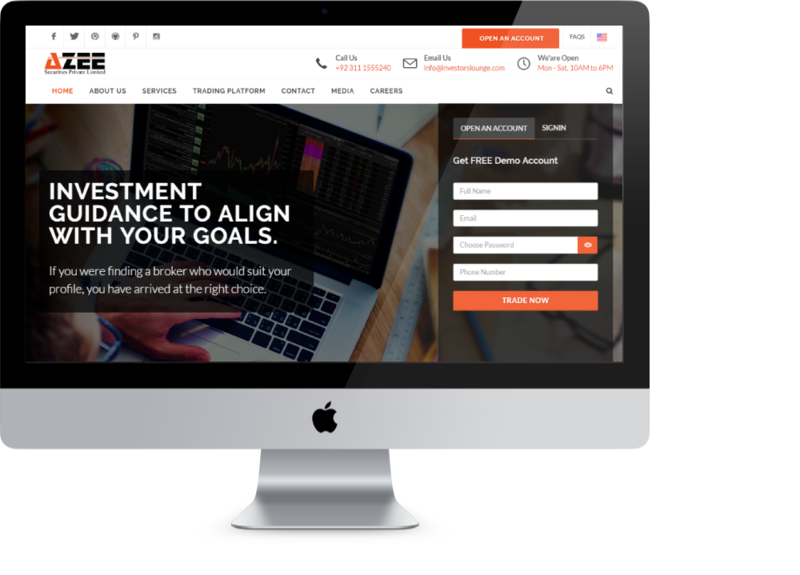 We provide investors with world class financial portal solutions to get the latest information about the stocks they are interested in. Get real-time market data and track your stock price real-time by adding the companies in your watchlist. Your trial account has expired. Kindly contact customer support team for account activation. You can start the conversation live through our chat support on the website. Looking forward to assist you! Investors Lounge & AZEE Securities will not accept any liability for loss or damage as a result of reliance on the information contained within this website including data, quotes, charts and buy/sell signals. Please be fully informed regarding the risks and costs associated with trading the financial markets, it is one of the riskiest investment forms possible. Investors Lounge would like to remind you that the data contained in this website is not necessarily real-time nor accurate. Therefore, AZEE Securities & Investors Lounge do not bear any responsibility for any trading losses you might incur as a result of using this data. Azee Trade- The Online Division of Azee Securities collects information from different parts of our web site so that we can provide a more interesting and useful service, as well as more appropriate advertising. We ask for personal information including (but not limited to) your name, email address, and other personal information when you register to our Web site, or if you sign up for special or personalized services such as contests, surveys and promotions. The more information you provide, the better we are able to customize our service to you. We may use your personal account details to analyze the trends on the platform. If you use our "Email page to a friend" service, you will need to provide us with your friend's name and email address and your email address as a return address. We will automatically send this person a one-time email as well as an invitation to visit and register with our site. We will not use these email addresses for any other purpose. Our objective in collecting personal information is to provide you with the best and most personalized experience possible, and to provide our advertisers with an efficient way to reach the right audience. In addition to the use of personal information to operate the site, Investors Lounge also gathers anonymous information, which may be used by Investors Lounge or shared with its partners. This information does not personally identify you, but may be helpful for marketing purposes or for improving the services we offer. Generally, this information is collected through "traffic data" and may entail the use of "cookies" "IP addresses" or other numeric codes used to identify a computer. We conduct research on our users' demographics, interests, and behavior based upon the information you provide us when you register or participate in contests or other promotions on our site, or based upon the information on our server log files. This research is compiled and analyzed on an aggregated basis. We may also notify you of products, services, or areas of our site that we think may interest you based on the information we've received. If you would prefer us not to contact you for these purposes, simply go to our opt-out page and let us know. When we show rankings of our members and their portfolios, we will use your unique member login name as a screen name. Please ensure that all information included in login names is acceptable to you for public display. Sometimes we ask for personal information when providing special features and services. You do not have to give us that information, but without it, you may not be able to take advantage of those products or services. For example, you will be unable to track your personal stock portfolio on our site unless you input the stocks you own, and you may not be able to gain access to certain areas of our site unless you register and/or subscribe. Azee Trade- The Online Division of Azee Securities will not disclose any personally identifiable information about individual users, except as described in this Privacy Statement. With the few exceptions that we explain here, we do not give, rent, lend, or sell individual information to our advertisers, although we do provide aggregate information. We may also use this aggregated information to help the advertisers reach the kind of audience they want. We may also disclose aggregate information in order to describe our services to prospective partners, advertisers, and other third parties, and for other lawful purposes. We are committed to protecting your personal information. We store information you provide us on our secure servers. 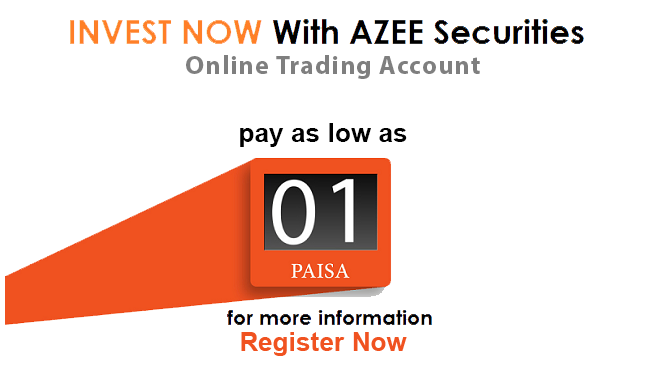 Personalized areas of our sites, such as My Azee Trade- The Online Division of Azee Securities, are password-protected. Only you have access to these password-protected areas. Do not share your passwords with anyone. 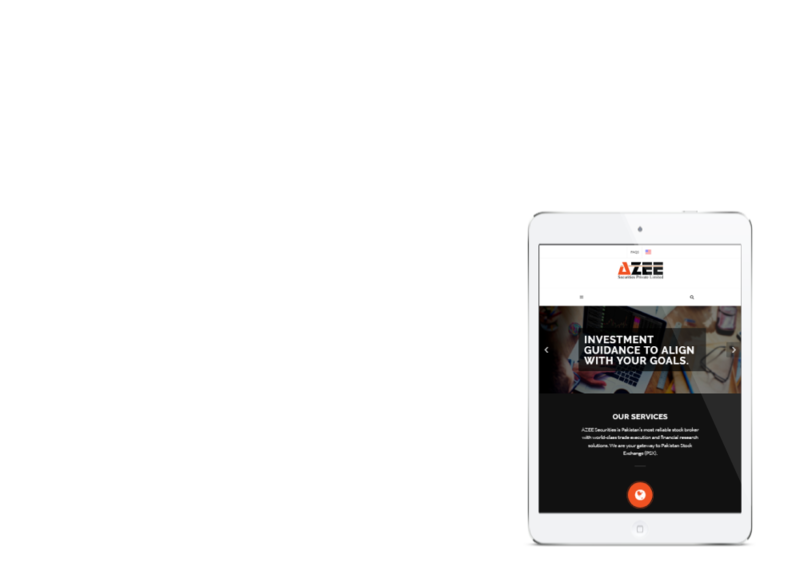 Azee Trade- The Online Division of Azee Securities will never ask you for your password in an unsolicited phone call or email. If you are using a computer to which others have access, such as one in a computer lab, Internet cafe, or public library, always remember to log out and close your browser window when leaving our site. The content and data of Azee Trade- The Online Division of Azee Securities are provided "as is", without any warranties. 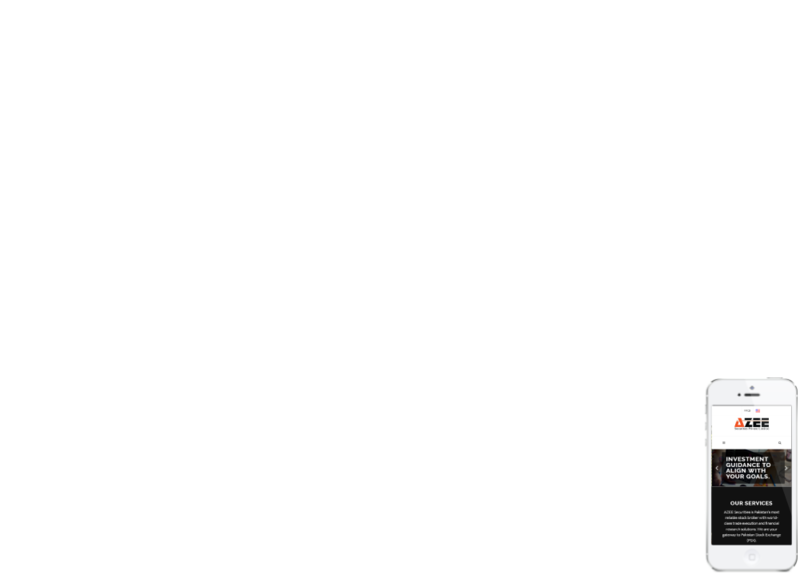 AZEE Securities, its employees, officers, directors, affiliates, agents and licensors cannot and do not warrant the accuracy, completeness, currentness, timeliness, non infringement, title, merchantability or fitness for a particular purpose of the content available through the web application, or the site itself, and AZEETRADE hereby disclaims any such express or implied warranties. We take all measures to ensure the accuracy of the data and correct any mistake as soon as it is reported. In no event shall , its employees, officers, directors, affiliates, agents or licensors be liable to you or to any third party or to anyone else for any kind of financial loss, lost profits, any special, incidental or consequential damage or any other similar damage or any other loss or injury, resulting directly or indirectly from use of the site, caused in whole or part by its negligence or contingencies beyond its control in procuring, compiling, interpreting, reporting or delivering the web software and any content on the web application. In no event shall Azee Trade- The Online Division of Azee Securities team, its employees, officers, directors, affiliates, agents or licensors be liable to you or any third party or anyone else for any decision made or action taken by you, your clients in reliance on such content on the site or the site itself. Our greatest value and asset is the trust of thousands of investors on our timely, accurate, and professional brokerage services. Suite # 208 2nd floor, Business & Finance Centre, Main I.I. Chundrigar Road, Karachi, Pakistan. Copyrights © 2016 All Rights Reserved by AZEE Securites.